Following his capture of Fort Henry and Fort Donelson, Grant’s army of 40,000 soldiers was ordered to move south, up the Tennessee River, to Pittsburg Landing. 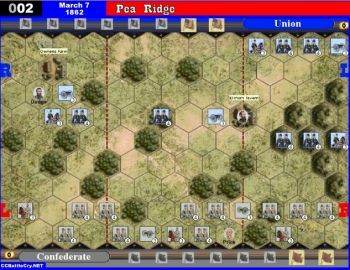 Buell was ordered to join him there with 35,000 troops. Once united, they could attack the important railroad junction at Corinth, twenty miles to the south. This would cut deep through the Confederate defense line in northern Tennessee. 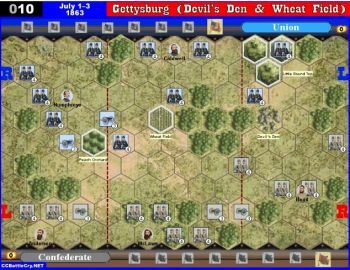 A Confederate unit that occupies any hex in the first row of hexes on the Union side of the battlefield counts as one victory flag. 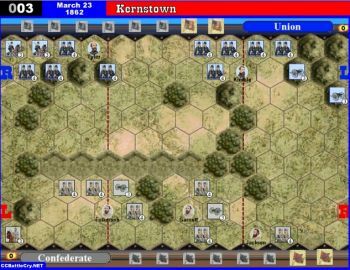 When a Confederate unit occupies one of those hexes, place a flag token on the Confederate victory stand. 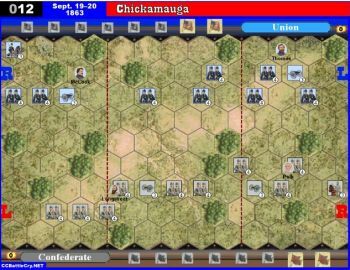 As long as the Confederate unit remains on the baseline hex, it continues to count toward Confederate victory. 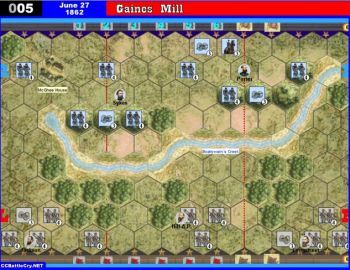 If the unit moves off or is eliminated, remove the flag token from the victory stand. 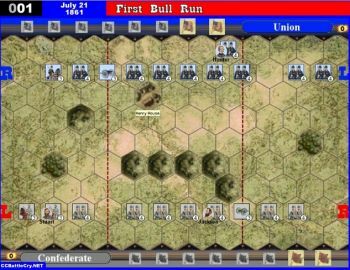 In the Shiloh scenario (BC:150 p.20), when are Confederate units on the back line counted—at the end of the Confederate turn, or the end of the Union turn? 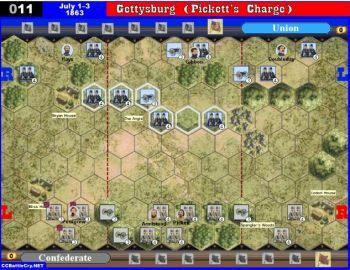 I say in the Confederate's turn, because you get flags in your own turn...but if in the Union turn, it always gives the USA player a chance to get them out of there...which is it? 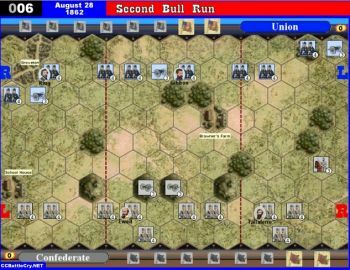 The turn a Confederate unit ends its movement on any Union baseline row hex, it counts as one Confederate Victory Flag immediately. 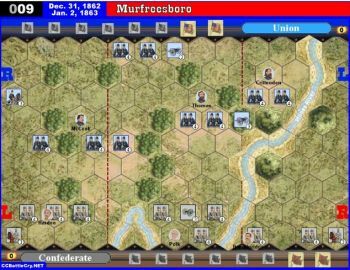 It continues to count toward the Confederate victory as long as it remains on the baseline hex. 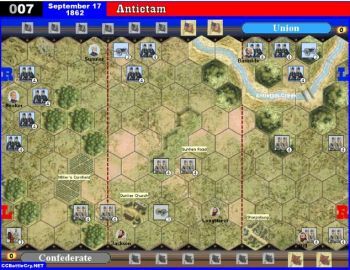 If the unit moves off or is eliminated, remove the flag token form the Confederate victory stand. I kind of dislike the scenario setup though. Just doesn't seem like the Shiloh situation. Where is Sherman? 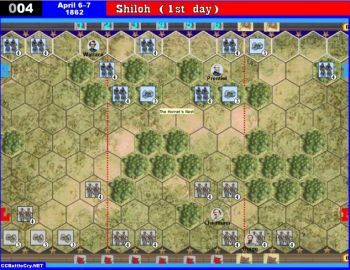 Definately find this one of the most balanced scenarios in my experiance; most of the time the victory is decided by one, at most two , flags.. 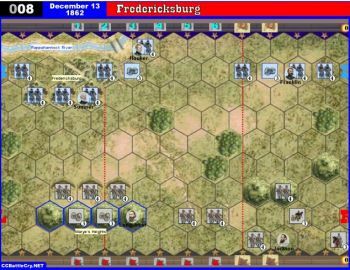 It is interesting how many times this scenario seems to recreate historical flow of the battle.